With only three starters lost to graduation, Red Bank returns an experienced lineup with eyes on big things in 2017. The Bucs will be well experienced, and deep, in the stretch from 113-160, led by the junior trio of Alex Peregrina, Luke Devine, and Sam Goldweig, who combined for 47 wins a year ago. All three have the ability to hit the 20+ win mark this year and could anchor what could be a very good stretch for Red Bank. Three starters return up top in senior Ben Riegelman, and juniors Paulo Luna and Mike Lahey. They'll be looked to provide leadership as several newcomers are expected to crack into the lineup here. The same goes for down at 106, where RBR will have several youngsters looking to make an impact in that spot. There's a pretty good mix of experience and youth here. The good news for the program is that they are now starting to get a healthy number of kids in the room with experience from a feeder program which had not been the case previously. While there's excitement surrounding the future of the program, the team still has eyes on getting things done this year. With the expansion of the Sectionals to eight teams, the Bucs are looking to qualify for the team post-season for the first time since 1996. 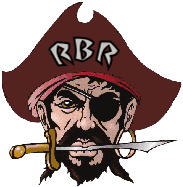 Individually, Red Bank is a team that could benefit nicely from the break up of their old District and the Region. They've been packed in behind the larger programs such as Long Branch, Raritan, Ocean, CBA, and the Middletowns in the District, so the hope here is that they can have several individuals make some noise come late February.